Recently I was on vacation on the island of Tenerife, the largest of the Canary Islands. 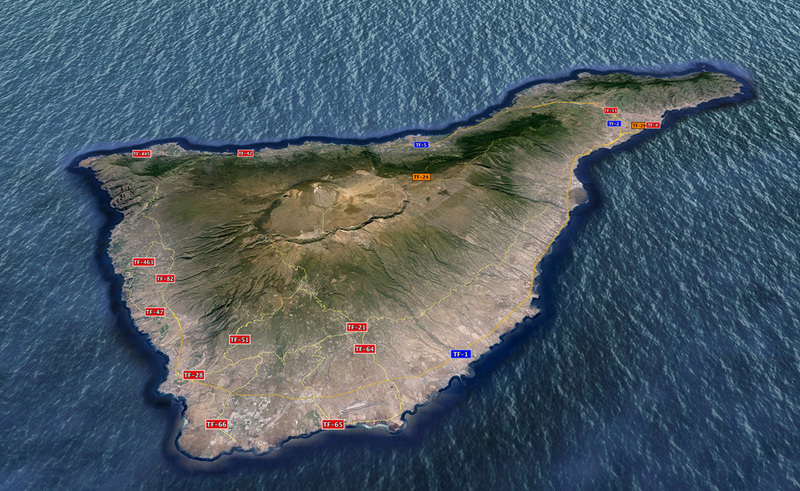 Tenerife is home to Spain’s highest mountain: El Teide, a volcano with 3.817 m height. 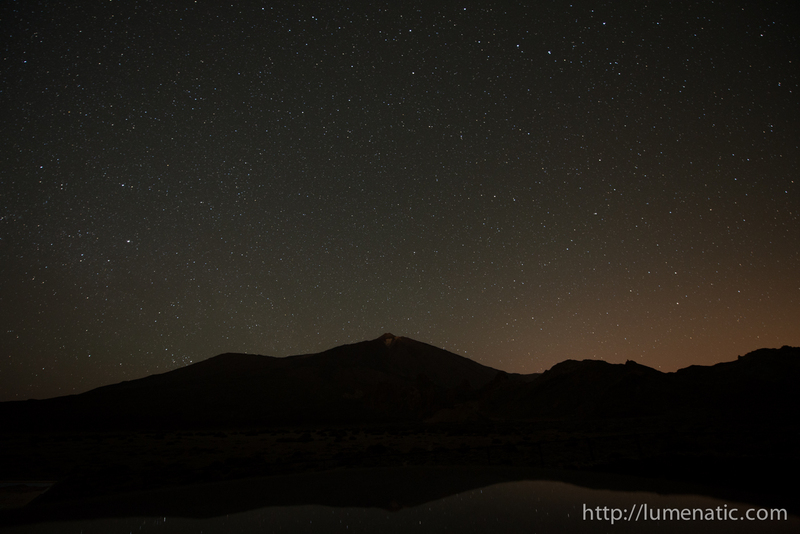 El Teide is located within an even larger and older crater, which gave me the opportunity to do something I was not able to do until then – photographing a night sky which is fully ablaze with stars. 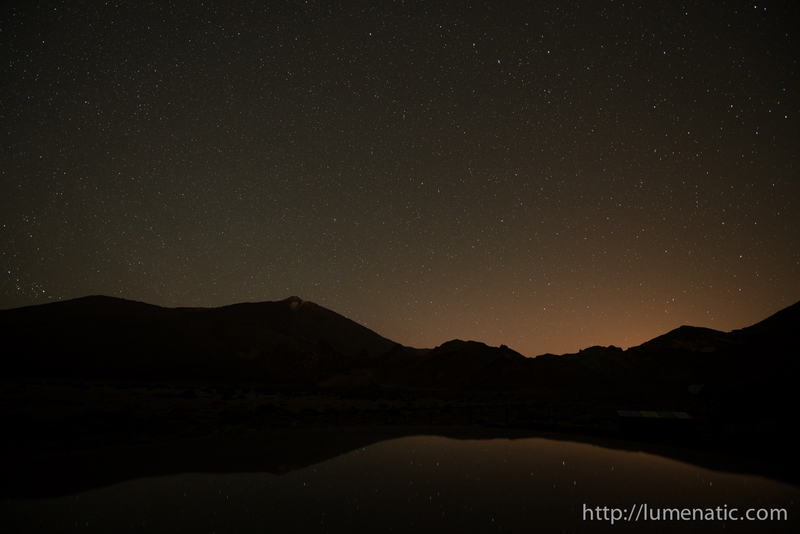 So one night I packed my photo gear and headed out into El Teide national park. After about 45 minutes of driving and reaching 2.200 m above sealevel I reached the large crater. 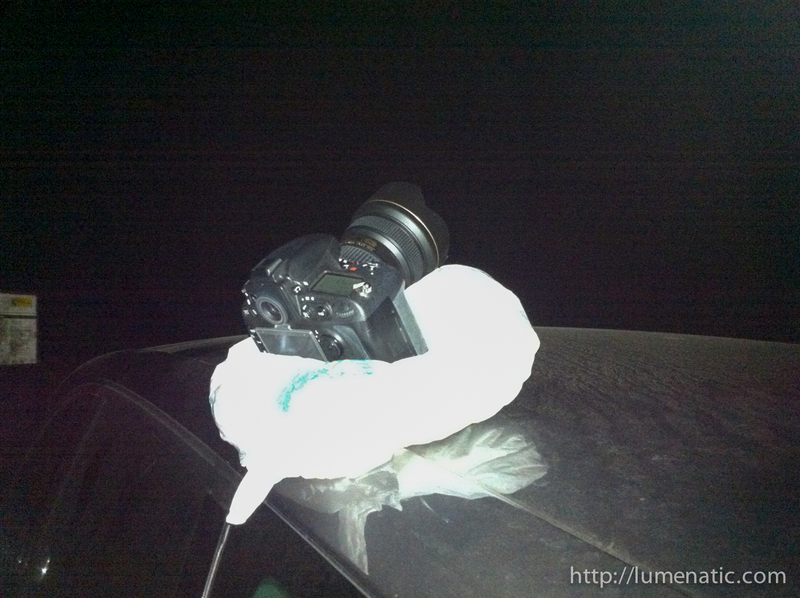 Since I did not bring a tripod to Tenerife I had to improvise. Initially I planned to buy a 2 kg fabric bag of rice and use that as a beanbag. Unfortunately I could not find such rise bags in local supermarkets, so I grabbed two plastic bags and filled them with… ahem… dirty laundry, mainly socks. I placed that bag on the car roof and worked from there. The dirty-socks-beanbag-solution worked, but it was not optimal. A bean bag holds the form you push it into. Compressed socks tend to relax a little and push the camera back once you take your hands off the camera. I used my D800 with the 14-24mm f2.8. Manual mode, f2.8, manual focus set to infinity and beyond! Initially I chose exposure times of 5-10 sec in order not to blur the stars. But soon I learned that a 30 sec exposure would show you even more stars and that the blur of the stars is negligible if you don’t pixel peep. I enabled long exposure noise reduction to optimize the images. In that mode after each shot the camera records the signals on the sensor with closed curtains and lowered mirror. No light reaches the sensor and the signals recorded by the sensor are therefore noise. The camera uses this reference photo to reduce noise in the recorded image. 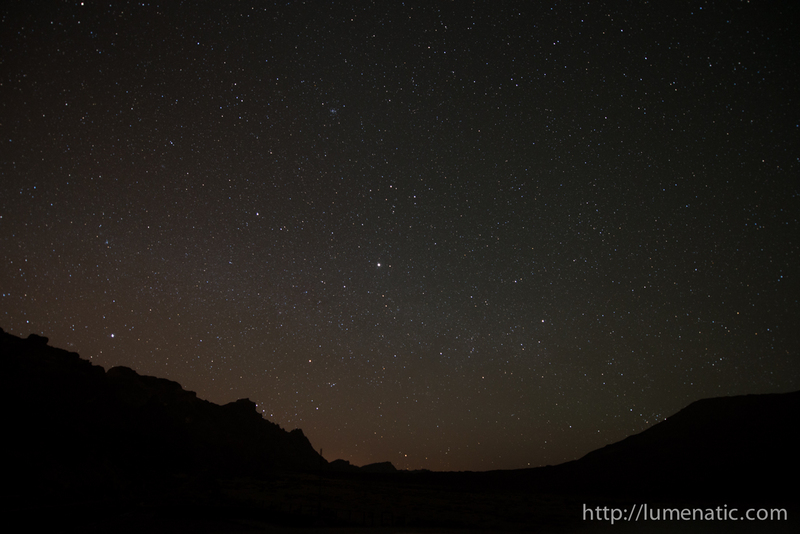 The number of stars one can see at 2.200 m and in absence of light pollution is astonishing. As most of us live in urban areas there is always the glow of the city which swallows thousands and thousands of stars. 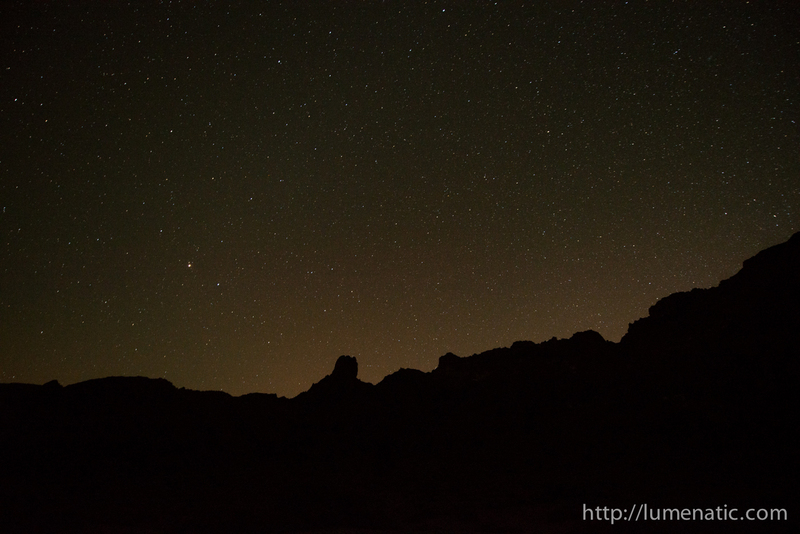 Up in the mountains and behind the rocky crater walls I could see a night sky which I have not seen for a long time. But even at this height, also being away around 20 km from the coast, a recognizable glow from the cities was shimmering over the top of the crater. I did not expect the light of the cities to be so strong. Another interesting experience was the darkness and silence. There was not any wind and no noises besides the ones I made. I have to confess that this was pretty spooky. Despite the amazing view I felt very uncomfortable because of the darkness. I am not generally afraid of the dark, but up there, in the crater, no noises, totally alone, in the darkness… that was a very primal fear which knocked and announced that it’s time to be scared. But taking that aside it was just great and I am very very happy that I made that nocturnal trip up to El Teide. 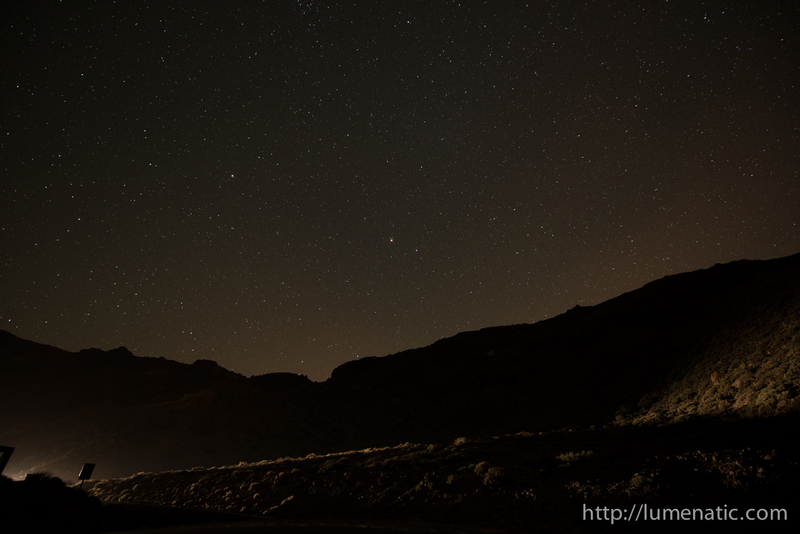 If I ever get another possibility to shoot such a night sky I will to it again immediately.